If you’re serious about fishing, come aboard the “Hot” Diggity Dog and enjoy a fully customizable Marathon Deep Sea Fishing charter. 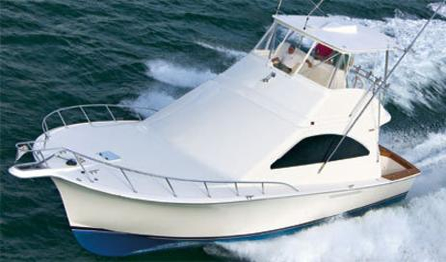 Enjoy your ride out to the fishing grounds onboard our luxurious 52′ Ocean Yacht Sport Vessel. Inside our fishing boat you’ll enjoy a comfortable full size cabin, featuring ice cold air conditioning and state-of-the-art electronics that help Captain Jim Purcell find the big ones. Our Marathon fishing charters target deep sea fish like dolphin, tuna, sailfish and marlin, and our wreck fishing charters focus on hard-fighting fish like grouper, snapper, tripletail, and amberjack. Strap yourself into the fighting chair and get ready for the fight of your life by putting our more than 40 years of charter fishing experience to work for you and your party. If you have a larger group, give us a call so we can accommodate your specific needs. Marathon fishing is world famous for a reason. 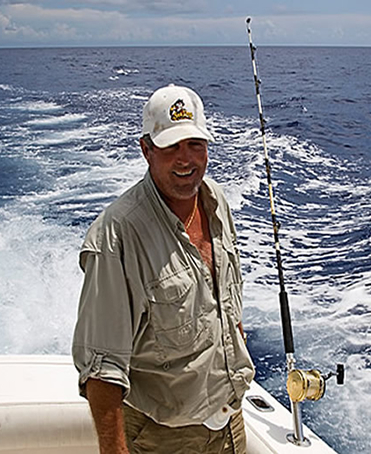 Find out why when you visit the Florida Keys by spending the day with Captain Jim Purcell, Offshore and Deep Sea Fishing Specialist for the popular television shows “The American Outdoorsman,” “Manny Fernandez’s Rod & Gun Club,” and” Adventures in Paradise. If you’re serious about fishing, then you’ve probably heard all about the incredible angling opportunities that abound in Marathon. We embark on our Marathon fishing charters near the center of the world famous Seven Mile Bridge. Our destination depends on the time of year and the kind of fishing you and your party want to engage in. Our Marathon deep sea fishing trips focus on the deep blue waters of the Gulf Stream, where waters as deep as 2,000 feet are home to hard-fighting tuna, lightning-fast dolphin, torpedo-shaped wahoo, and leaping sailfish. We can also focus on the many wrecks around Marathon that hold big bottom fish like grouper, snapper, cobia, and amberjack. The fishing is often so good in our area, it’s hard to decide exactly what you want to target, but sometimes the weather and season helps us narrow down the options. The Hot Diggity Dog is not your ordinary fishing boat. 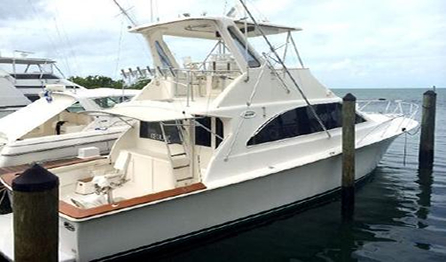 Our vessel offers a level of comfort that appeals to anglers with the most discerning tastes, and who understand that a fishing trip should be enjoyable even when you’re not reeling in fish. Jim Purcell is the Captain of the Hot Diggity Dog, and his family has been living and fishing in the Florida Keys since the 1950’s when Jim’s father, Web, captained their first vessel, The Virgalona. Captain Jim is a USCG 100 Ton Licensed Master Captain, so you know you’re in good hands when you step aboard his vessel. The Hot Diggity Dog is the envy of the entire Marathon fishing fleet, and with good reason. One of the first things our charter fishing guests notice is the fighting chair. It’s the dream of every angler to strap in and fight the big ones, so you can probably already imagine what it’s like to take your turn in the chair and put your fishing skill and agility to the ultimate test. The spacious deck offers plenty of room for every angler, even when we face multiple hookups or are casting toward schooling fish. Our full size outriggers help to keep our lines from tangling, and a large live-well makes sure every bait is spry and ready to do its job. The Florida heat is a concern for many of our guests, and it’s a legitimate one. Even in the “cooler” months, temperatures can soar into the 90s, and when you’ve been in a prolonged fight with a determined tuna, it’s nice to know you can step inside our full-sized cabin and chill your bones with ice cold air conditioning. The cabin of our Marathon fishing boat also boasts a spacious communal area, not unlike your living room. You can kick back and relax with a cold one while Captain Jim works hard to find the fish. Our full galley puts food and beverages at your fingertips, so you don’t have to worry about running low on fuel when a big sailfish makes its third long run. 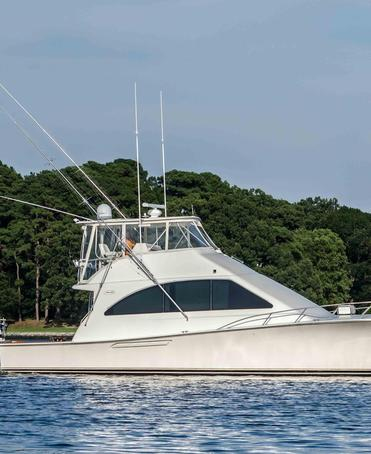 Every facet of your Marathon fishing charter should be enjoyable, and the 52′ Ocean Yacht Sport we call the Hot Diggity Dog will not disappoint. Fishing success often comes down the gear and equipment used in pursuit of fish. Cutting corners on gear often ends up in a cut line, which is why we use only the best fishing equipment on all of our charters. In the Keys, you can’t beat live bait, so we make sure to have a fully stocked live well when targeting the fish that like them. We use Penn reels, which are still the industry standard for fishing the corrosive Gulf waters. We provide deep drop electronic reels when fishing deep, so that you can save your strength for the fish instead of getting sore from checking your bait. All of Captain Jim’s electronics are modern and well maintained. Not only do we have top-quality fishing electronics, but we maintain the best radio and GPS systems to ensure your safety on the water at all times. If any emergency arises, the boat is equipped with all of the necessary first aid and emergency gear required to keep everyone on board safe and secure. Every Marathon fishing charter includes a qualified, hard-working deck hand, who will offer advice when needed, keep the bait on your hooks, and help you land anything that is destined for the grill back at your Marathon hotel. Marathon, Florida is situated in the middle of the Keys. The city is on a collection of keys that include Boot Key, Long Point Key, Fat Deer Key, Knight’s Key, Crawl Key, and Grassy Key Islands. With a population a little over 10,000, Marathon is a little bigger than many people realize, but it still has the same small town charm it did many years ago. Best of all, the fishing in Marathon is considered to be some of the best in world. The sheer variety of fishing possibilities is staggering, and it’s possible to target inshore and offshore fish in a single day. Marathon got its name when workers on the Florida East Coast Railroad worked long hours to complete the railway. Some of those workers described the seemingly never ending project as a “marathon,” and the name was eventually used for the local railroad station. Marathon’s climate is tropical, which means it is often hot. While the cool breezed from the ocean offer a welcome respite, the summer months can still be quite challenging for folks with thicker blood. Air conditioning is a must when staying at a hotel in Marathon, so it makes sense to fish from a boat that also has air conditioning. Sport fishing and other water sports like snorkeling and diving drive the local Marathon economy. Marathon deep sea fishing is popular with locals and tourists alike, but nature enthusiasts of all sorts also flock to the area to see rare birds, porpoises, and even the occasional whale. There are numerous seafood restaurants offering local fishing fare in Marathon, which underscores the vitality of the local fishing grounds. In an effort to whet your appetite for what to expect on your fishing charter, we offer the following information about some of our more popular local game fish. Remember, we can customize a Marathon fishing trip around your specific needs, so if you’ve always dreamed of catching a particular fish give us a call and get more information about the best time of year to make your dream a reality. Dolphin – Depending on where you’re from, you may call the dolphinfish mahi-mahi or dorado. No matter what you call them, these are some of the most sought after fish around Marathon, and with good reason. Dolphin hit hard and fight even harder. They are fast growing fish, highly sustainable, and one of the best eating fish in the ocean. Big dolphin are a challenge for even the most seasoned angler, and when we get into a school of fish the action can be non-stop. Tuna – There are multiple varieties of tuna in the waters around Marathon. They are all fast and aggressive, especially when schooling. Small tuna fight hard and can put a serious bend in your rod. Big tuna will put a serious bend in your back, so if we get into big ones we will strap you into the fighting chair and find out if you have what it takes to get them to the boat. Wahoo – Wahoo are one of the fastest fish in the ocean, topping out at speeds of over 60 miles per hour. We often encounter these torpedo-shaped fish on our Marathon deep sea fishing charters in the Gulf Stream. Sailfish – For sheer excitement, it’s hard to beat sailfish. It’s not uncommon to catch multiple sailfish on a single outing, and few fish offer a better photo opportunity for your Facebook profile. Sailfish are fast, make strong determined runs, and can leap from the water in an aerial display that put most other fish to shame. Marlin – These are the big daddy’s that are synonymous with Hemmingway and all other great fishing stories. Fighting a marlin is one of the great angling experiences, so if catching one is important to you, then it’s vital to plan a charter around the times of year when marlin fishing is at its best. There are a number of other incredible fish species we target on our Marathon fishing charters, including tripletail, cobia, swordfish, grouper, amberjack, and snapper, just to name a few. Let us know what most interests you and your party so that we can customize a charter that seeks to achieve your personal angling goals. If you have a larger group, give us a call so that we can arrange a Marathon charter that meets your needs. Whether you’re on a business retreat or vacationing with friends and family, the Hot Diggity Dog offers unmatched offshore angling excitement. 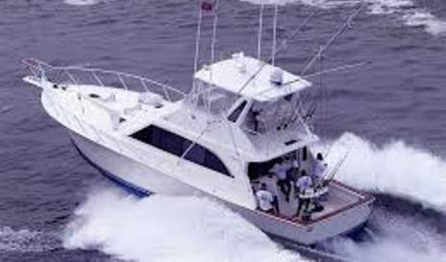 Schedule your Marathon deep sea fishing trip with us today.